KJIPUKTUK (Halifax) – A lot of people on social assistance live with mental health issues. Often these mental health issues cause people to fidget, talk to themselves, or do other involuntary body behaviours. At times Employment Support and Income Assistance (ESIA) recipients who have involuntary body behaviours, but are not causing any trouble and are just minding their own business are being bothered by police or private security guards. I recently learned of three people who had this happen to them in Halifax. As you will see, one of those three incidents ended up badly. The first case is about a person who was inside a public building in early December, sitting on a bench waiting to meet someone. Two of the building’s private security guards came along and asked what he was doing there. The second incident happened when it was income assistance check day at the end of October, This ESIA recipient was done his shopping at a dollar store located in a local shopping mall, and he took a seat at a table in the food court. All he was doing was sitting their minding his own business and organizing his stuff getting ready to go home. Well, this person told me he was not drinking before coming to the mall, and that he stays away from alcohol altogether, so there was no reason for the public walking by to think that. Anyway, this ESIA recipient was a bit offended and when he got up quickly and left the building, security followed him. He was happy his bus was outside waiting for him or otherwise he would not have known how he would have handled himself. The third story is more ugly. This one gets the police involved, the person was actually put in handcuffs and taken to the hospital. The police officer said this had to happen because of what the law in Nova Scotia says. You can read this law here, the Involuntary Psychiatric Treatment Act. The police made him stand up and they used the breathalyzer on him to see if he was drinking. This income assistance recipient then got offended that the police made him do this, because he was not drinking at all. The police then said to him “you are too hysterical to be out in public today.” At that point, they put the handcuffs on him and took him to the hospital. Big hand movements that make a person look like they are trying to start a fight with someone. Failing to smile, or giving the wrong type of smile. The reality is that in the view of financially well-off people that those are nothing but mental health consumers not taking their medications. Besides these three cases I just talked about I have heard from many other ESIA recipients that they have had the experience of getting spoken to by police and security about their involuntary body language. They also said that is made them scared to the point where they only want to leave their apartments to go to the drop-ins and soup kitchens. At least when they are at those places they are around people who understand them, they say. I wonder if there is more of a role for Community Services here. ESIA and many mental health services are both run by the government. Maybe the departments involved could work more close together? I will end this story with one more question. Is the reason why this happens to ESIA recipients because of something wrong with our mental health system in Nova Scotia, or what? How often do we walk down the street, or in a mall and hear people talking loudly or laughing with someone we don’t see. Those people have smart phones; they wear earbuds and are talk to someone thru a tiny mic. No one criticizes them or calls them mentally ill. The police are never called. Every foodcourt has loads of people talking on their headphone mics– Maybe those people look cool, or well off. There is discrimination against the poor, those with messy or unfashionable clothes, or those who don’t respond the way people who have jobs (and want to keep them) have been trained to respond. Part of this is the tyranny of our learned “customer service” behaviour. Be polite, be responsive, don’t cause waves, assist those who are buying and shopping. Anyone who acts differently, who sits and doesn’t buy, who waits and doesn’t check email or facebook, who is visible yet dresses poorly, who appears alone — is suspect– yet in truth they are not a threat. Clearly our “well trained police” and minimum wage security guards are on the same page in this. Both have no regard for differences and make life intolerable for anyone different. Paladin Security is the culprit. 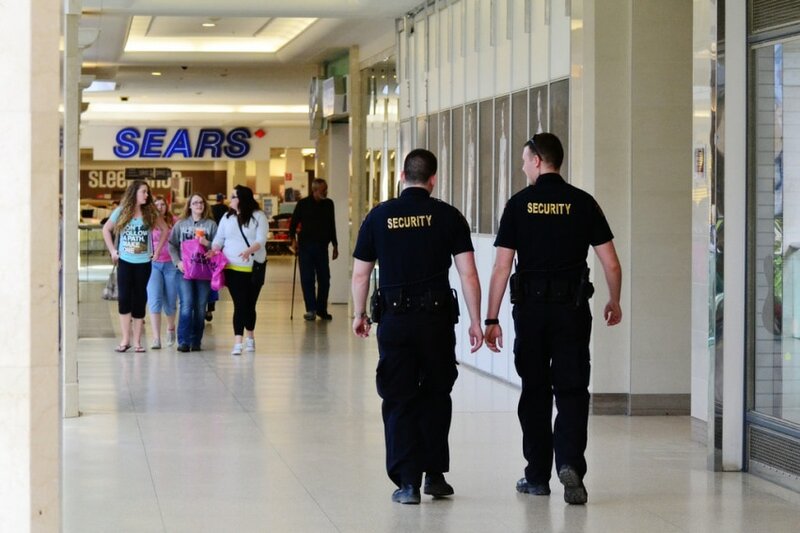 They are the ones policing the shopping malls, grocery stores, and even public venues. At some point all those places decided to go with Paladin for some odd reason and that has given the company a certain level of autonomy. wouldn’t be surprised if the malls are getting the security for free. in addition, the police force has gotten smaller.